I realised the other day that it had been 2 years since the first post appeared on JibberJabberUK. It was for Malt Loaf and something which I still make now. I haven't changed the recipe but I can tell you it freezes really well and has helped Mr JibberJabber get round several half marathons. I let the first anniversary of the blog pass by but I thought I would take this chance to have a look back on things. At first I wrote only recipes on this blog but I have since expanded to include gardening, travel and a weekly photography slot in the form of Sunday Snap. I've managed to sneek in some of my favourite things and places such as post boxes, AFC Wimbledon, Doctor Who, cycling, Northumberland and the Isle of Wight. However, I have always tried to keep the focus on food simply because everyday we all need to eat and to enjoy what we make and eat. 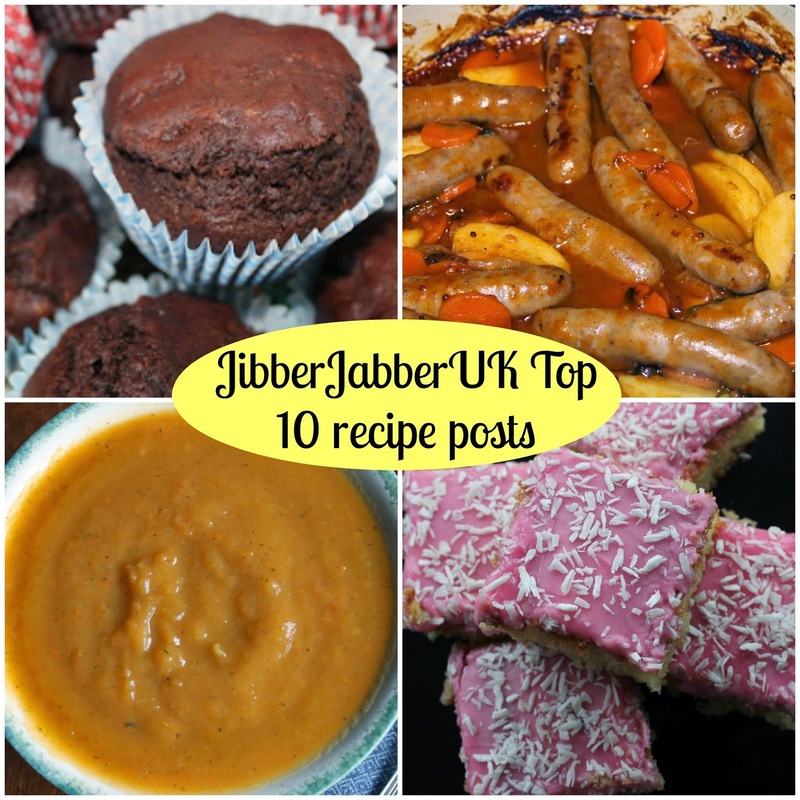 So without further ado here are the top ten most viewed recipe posts on JibberJabberUK. Sausages are always a winner at JibberJabber Towers and this one is perfect for cold days. I add a bit of veg in and then for some sweetness any apple from the fruit bowl. Forget the shop-bought flapjacks with all the added extras in them. These have just five ingredients in them and can be whipped up in no time. My husband swears by them for his long distance runs. 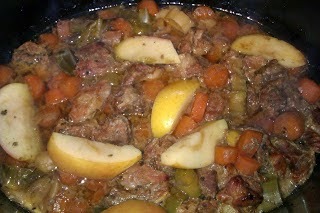 The first recipe in the top 10 which uses my beloved slow cooker. This was adapted from a recipe in The Great British Bake Off Winter Kitchen. It was originally intended to be a casserole cooked in the oven but any hint of a long cooking process means it goes in the slow cooker for me. As part of the ingredients search I also had a trip to an iconic Sheffield beer shop. One of the all-time classic recipes and a definite family favourite here. I wrote this recipe up after a request from Father JibberJabber for the exact method. This did highlight one of the problems of food blogging in that you have to give precise measures for ingredients rather than just knowing by eye. It also features my cheats' method of making a cheese sauce from scratch using just flour, milk and cheese – no roux required! A little bit of luxury in a thrifty way. By using smoked salmon trimmings or offcuts this transforms a standard pasta dish into something a bit special. Remember this recipe too for later in the year when you are wondering what to do with your glut of courgettes. This is a recipe that shows making a home cooked meal needn't take much time to put together and requires minimum skill. I can't say this is an authentic recipe for a pork Creole dish but it certainly turns it into a family friendly one. We're now getting to the recipes that are searched for everyday on the blog. I love soup but I hadn't made it in the slow cooker since I made a batch of potato and garlic soup when I was at university and I managed to stink out my flat. Now I make all my soup in the slow cooker and wouldn't have it any other way. 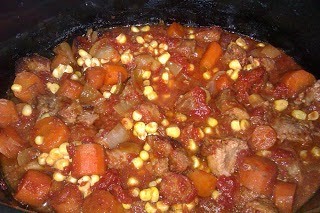 Yes, I really do love my slow cooker and it seems many other people do too. I will admit this dish isn't much of a looker but it really is so easy to make and very tasty. I used to buy packet mixes years ago to make a similar dish but then I came to my senses. I've lost count the number of times I have cooked this meal but I know I will still be making it again and again for years to come. It had to be cake at number one. I was inspired to make this after it was featured on the Great British Bake Off. I had never heard of it before that episode but I was rather intrigued and did a bit of research on it. It seems there's a lot of love out there for a sponge traybake topped with shocking pink icing and desiccated coconut. With so many views for the recipe I had to make it part of my blog header and nothing else comes close to it for its popularity. So thanks to everyone who has stopped by in the last two years. I hope you stay and have a look around and here's to the coming years! Joining #TheList with Aby at You Baby Me Mummy and Hannah at Mums' Day. They all look and sound delicious, especially that lasagne! At one stage we used to have lasagne every Saturday night!